I know I know, I am getting carried away with experimentation but really this one came out really good! I love Thai food and especially just the taste of the “liquidy” part of their spicy curries with plain jasmine rice left after all the meat has disappeared from my plate. 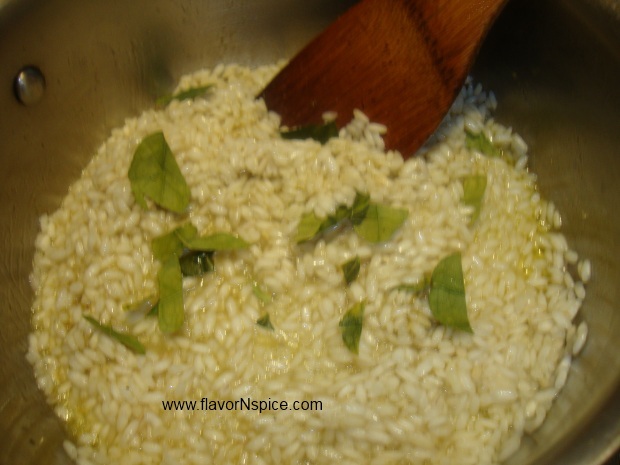 Sticky rice or jasmine rice has high carbohydrate content and it absorbs flavors really well. 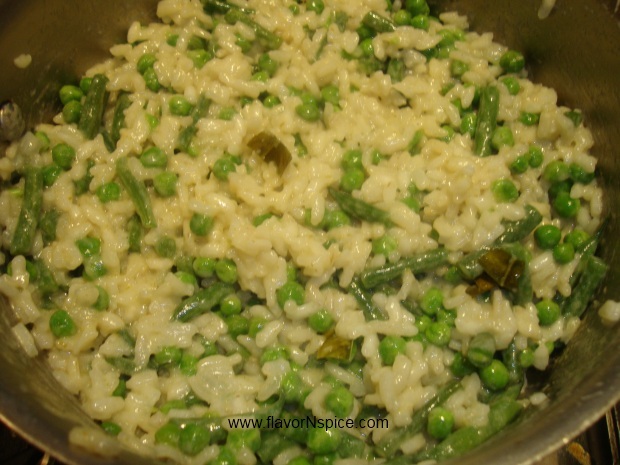 The same is true for Arborio rice and that is why the Italians like to use this rice for risotto. 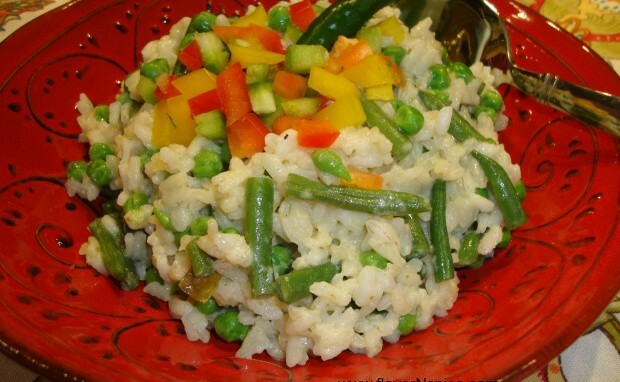 The dominant flavor of the risotto gets infused into the rice as it is slow cooked and that is what gives risotto the comfort-food-quality that we call love about it. So today I decided to combine Thai flavors with Italians techniques. I cooked Arborio rice with Thai green curry and coconut milk combined with chicken broth (standard Italian ingredient for Risotto). 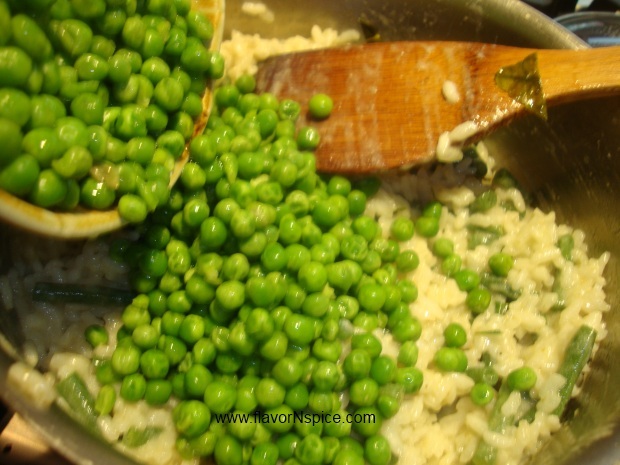 The coconut milk was perfect in giving the risotto a rich creaminess and then I added beans and peas to add to the “green-ness” of the dish and the crunchy multi-colored bell peppers gave it great texture. 1. In a medium sized pit, pour the extra virgin olive oil and heat it over low heat for a minute or so. 2. 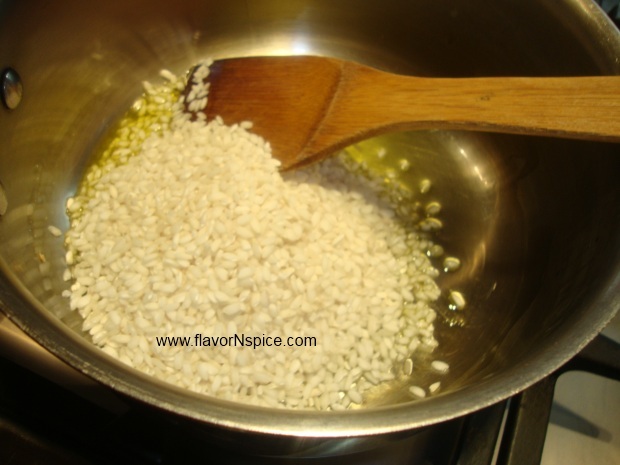 Add the Arborio rice and stir thoroughly so that all the rice gets covered with the oil. 3. 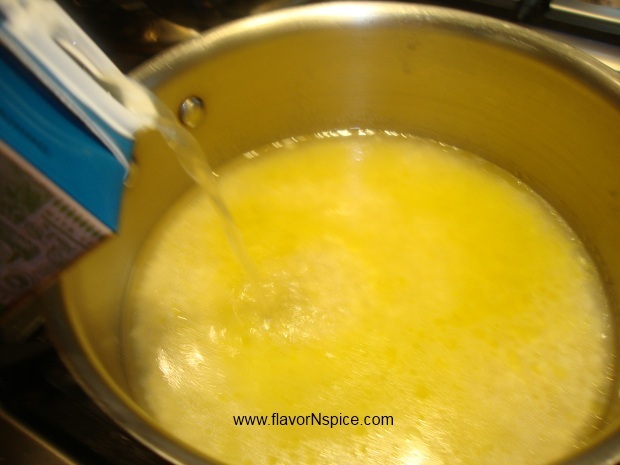 Add ½ cup of chicken broth and stir. 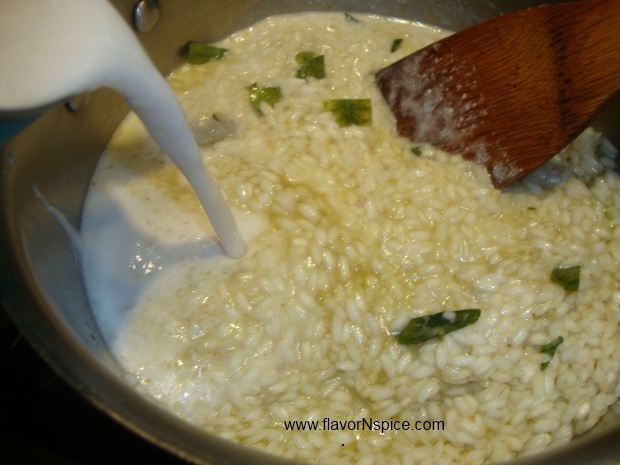 The trick to making good risotto is to add a little bit of broth at a time and to keep stirring the rice frequently – this gives the rice a creamy texture and it gets cooked and plumps up well. 4. After 3-4 minutes, add a little bit more broth and stir. Now add green curry paste and stir. 5. Repeat this step after every 3-4 minutes till all the broth is gone (usually takes 15-20 minutes over low heat). 6. Also chop the kefir lime leaves and add them to the pot and stir. 7. Now the coconut milk and stir. 8. 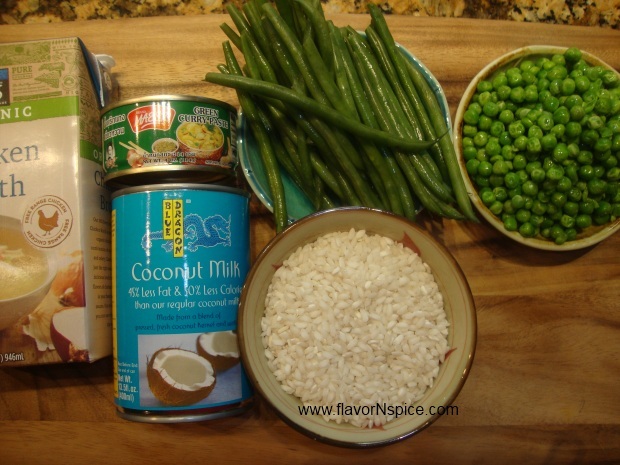 Continue to cook and stir until the rice is soft and creamy. If it looks like the rice is sticking to the bottom of the pan, add a little bit more broth and stir thoroughly. 9. 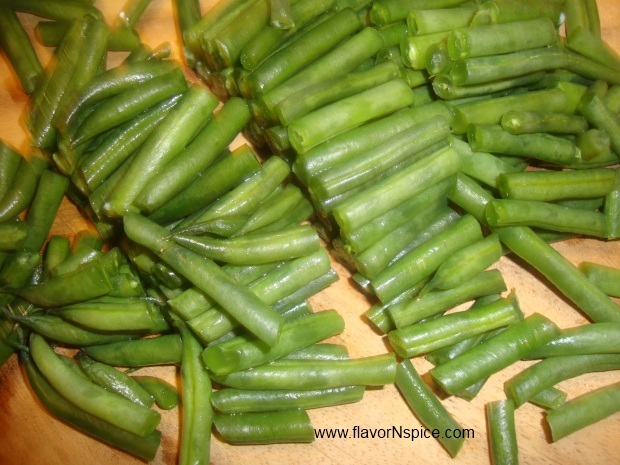 While the rice is cooking, chop the green beans in bite sized pieces. 10. 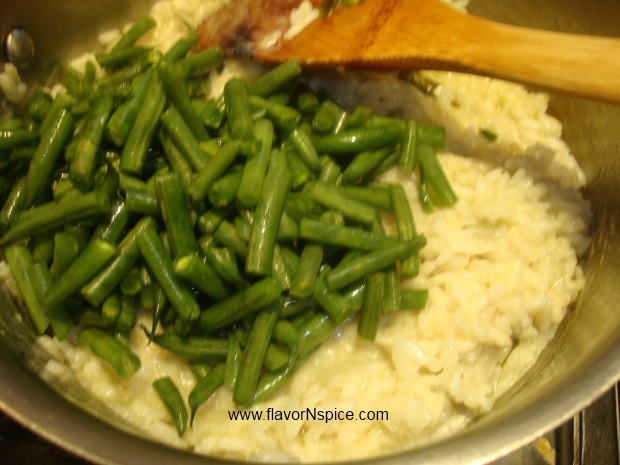 When the rice looks like it is almost done, add the green beans and stir. 11. Add the thawed petite peas to the pot and stir again. Let these cook for 2-3 minutes in the rice over low heat and then turn the heat off. 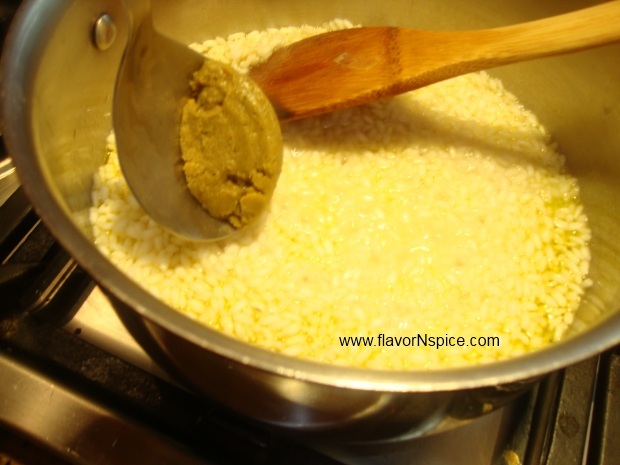 Let the rice sit in the pot (covered for 3-4 minutes for the flavors to get blended and happy together). 12. Chop the bell peppers in a fine dice and add them on top of the risotto as a garnish. 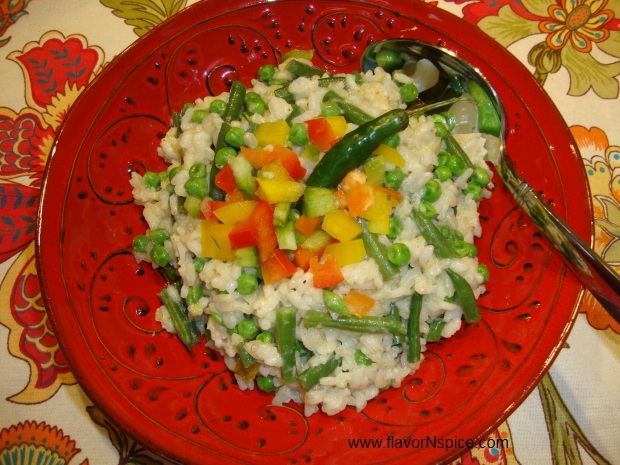 Serve the risotto while it is still hot. 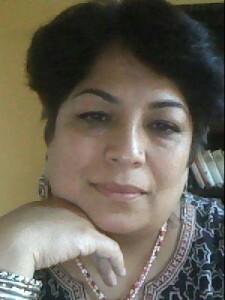 Hi Shilpa – it came out really well – I used the kefir lime leaves you gave me. While Shakeb is out of town, I get lazy about cooking for just one, so this was yet another one pot dish for me!